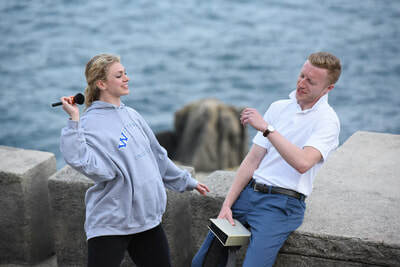 Hey, Hamlet, what’s with the the hoody, the headphones, the high fives, the chest bumps and air guitar strumming – this is serious man, you’re a prince, this is tragedy. The quiffed and coiffeured prince in sunshades and sneakers has a clear sense of fun that actually makes this long play so compelling and watchable that nearly three hours simply fly by. 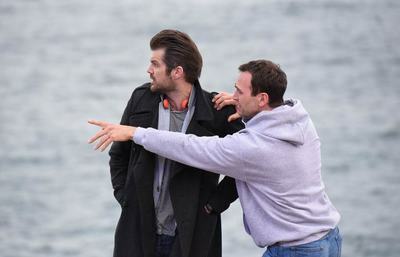 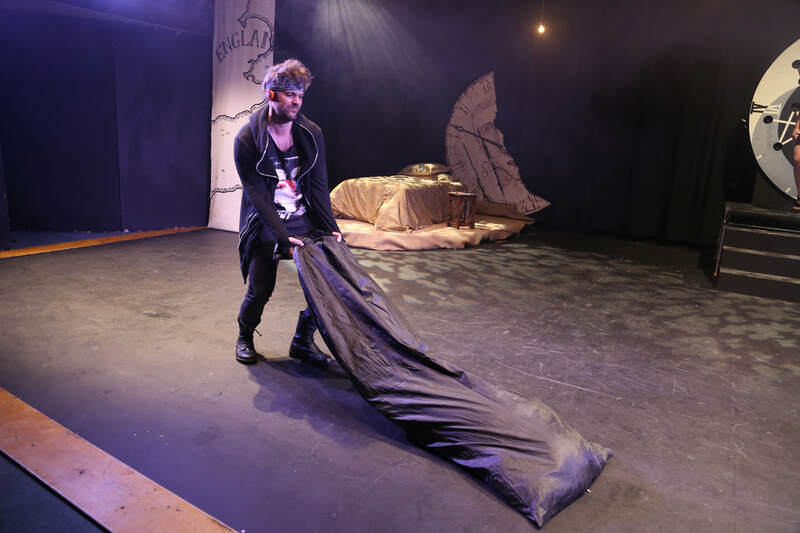 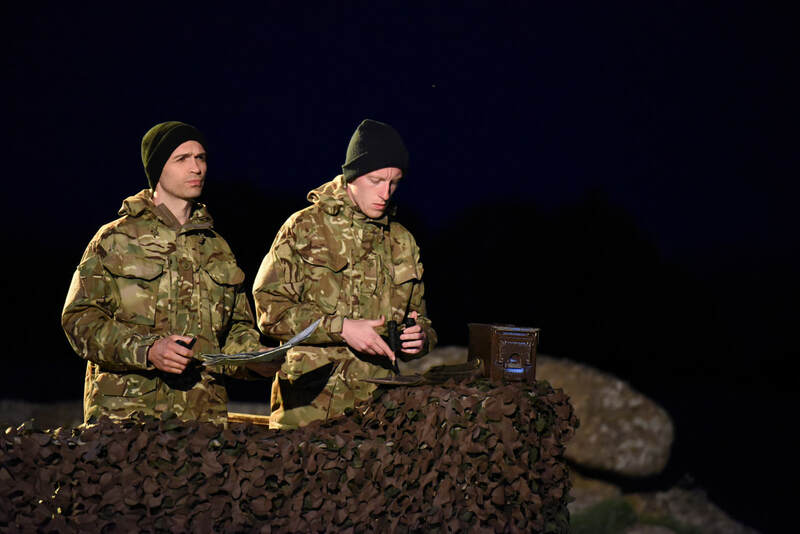 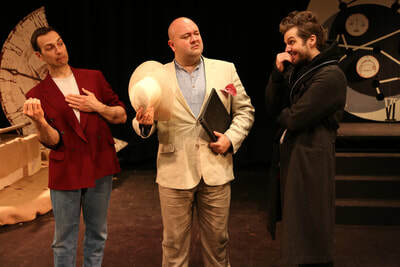 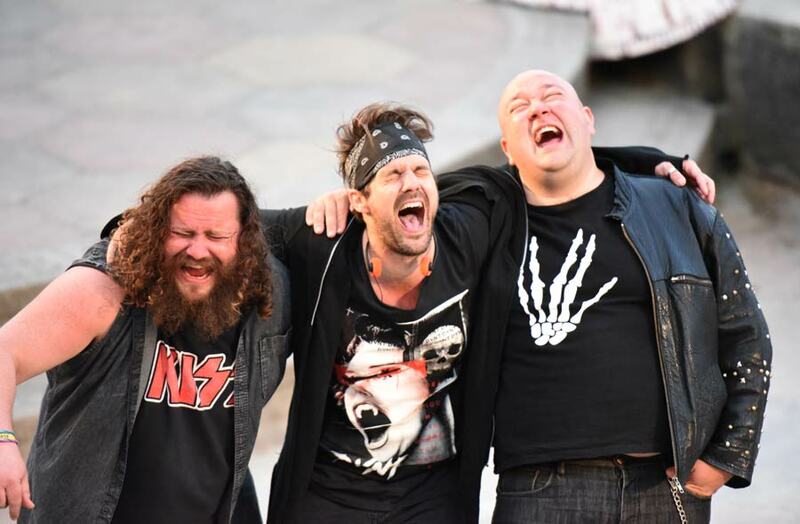 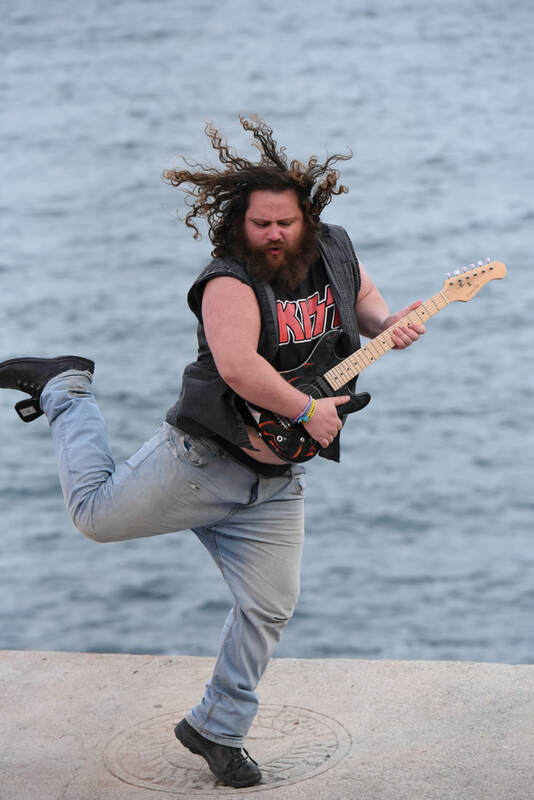 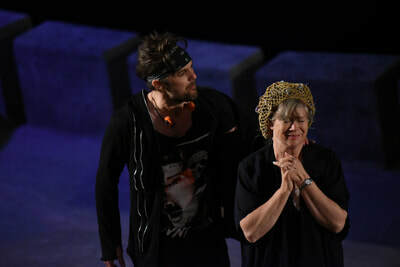 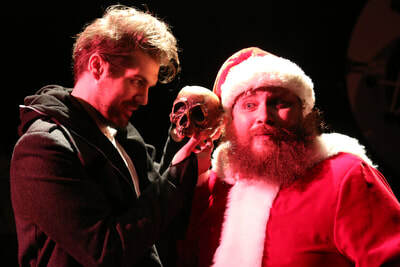 In fact, Dan Avery’s modern interpretation of this difficult role, directed by the multi-talented Chris Chambers, was exceptionally fine, and he carried a strong cast along with him, notably including Drummond Bowskill and Jan Szafranski as two hairy bikers, Rosencrantz and Guildenstern. 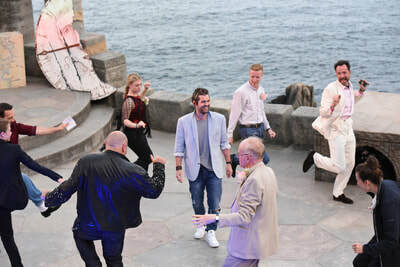 He was backed by a rock music based thrumming, time-ticking soundtrack, sometimes electronic and disturbingly discordant, at other times choral and joyously uplifting, composed by Chris and delivered by sound technician Joseph Lyndon, with a clock aware set designed by Emeline Beroud. 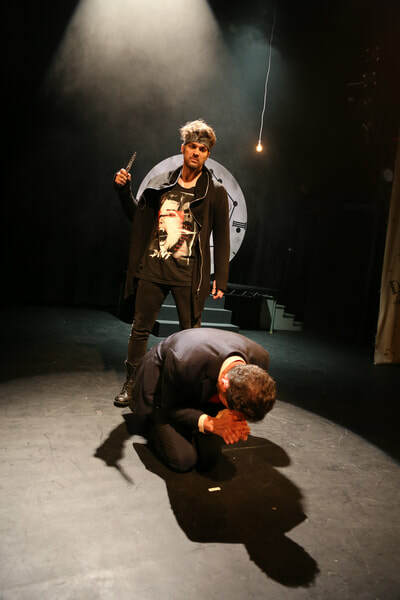 So, here was a mix of dark drama given a contemporary slick-suited slant that will never please the traditionalists, but it was bold and brave and convincing with every word clearly spoken and understood. In the stylish programme, which he designed, Dan is shown holding Yorick’s skull reflected in his sunglasses. 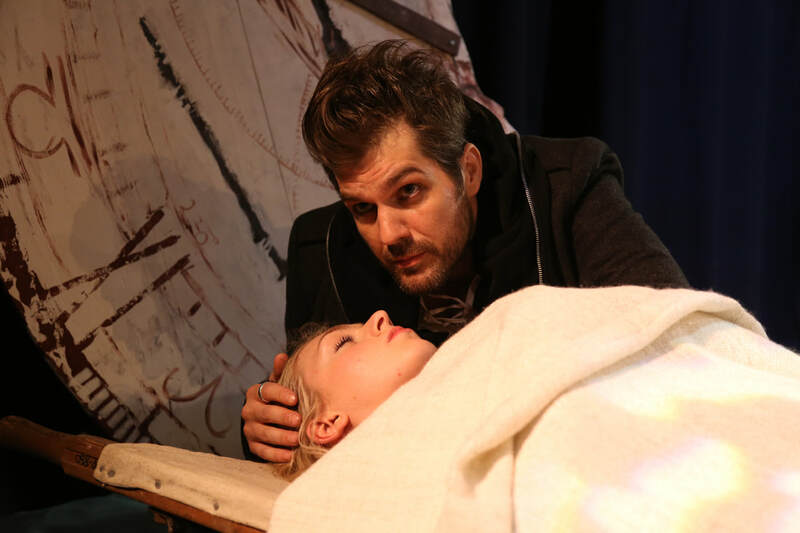 In it, the professional actor, who is also an A&E nurse, outlines his exhaustive research of the role of Hamlet, the prince who discovers that the King of Denmark, his father, was murdered by his uncle (Stephen Ashmore-Blakely) who has now married his mother. 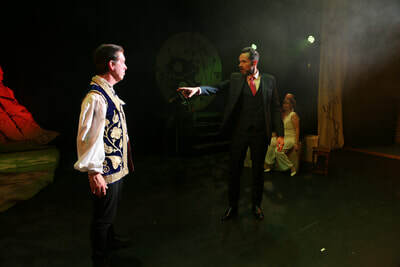 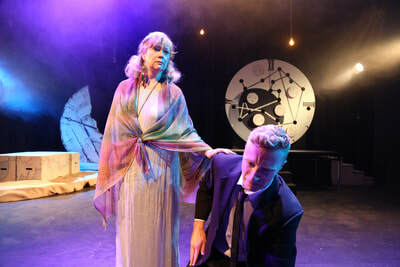 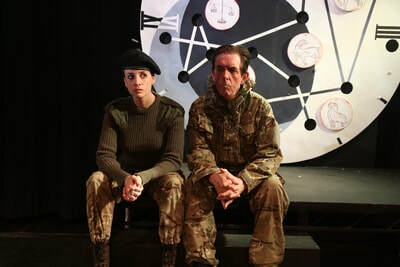 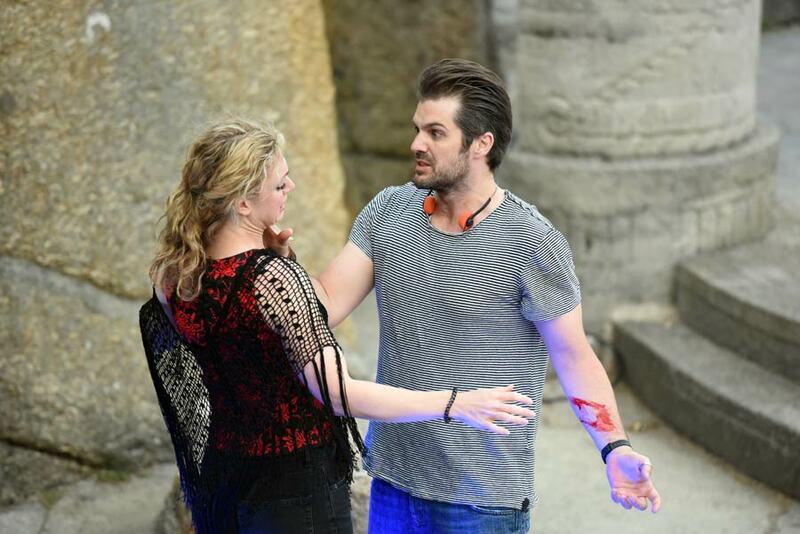 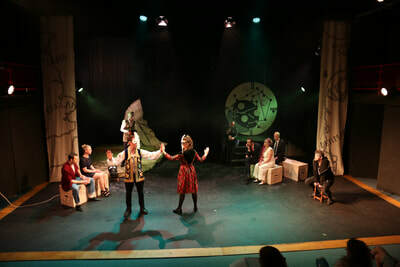 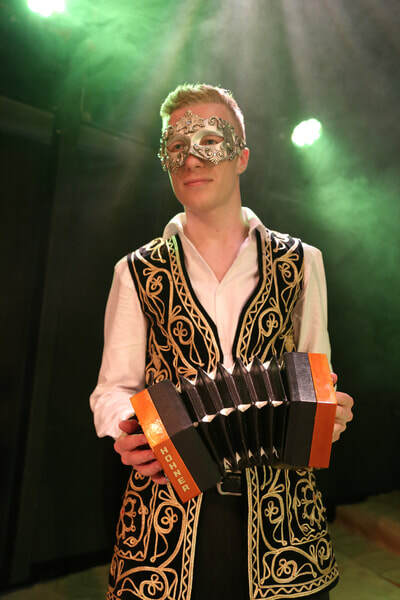 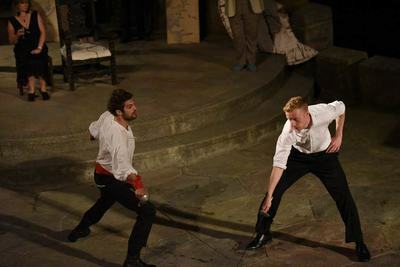 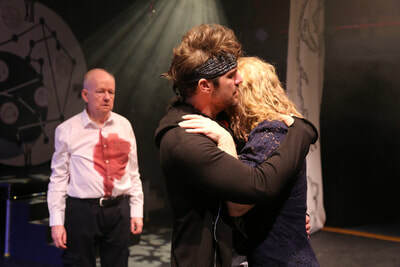 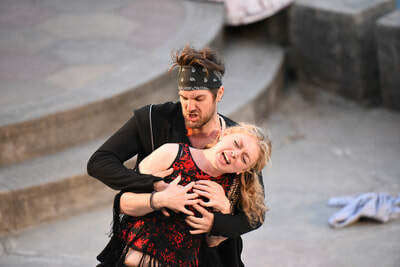 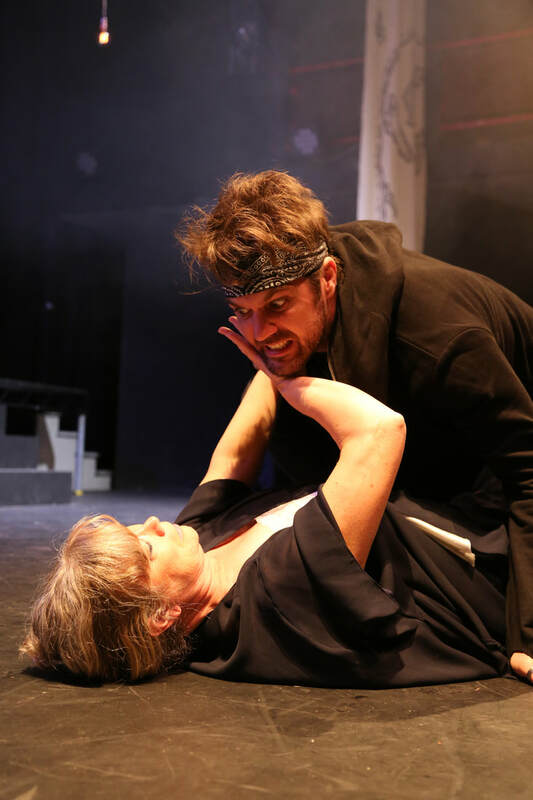 It’s enough to upset anyone, and Dan plays it with a controlled energy and emotion that wins the sympathy of his audience and especially fellow cast members Andrew Fitch as his best friend Horatio, Rebecca Pickering as Ophelia in stilettos, Robert Rowe as Polonius, producer Nicky Chambers as his mother, and Matthew Headon as Laertes. 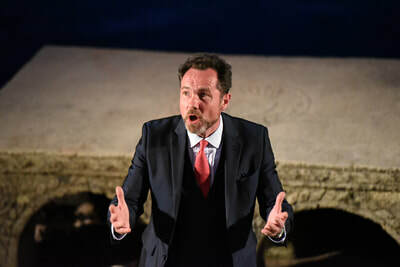 Anthony Allgood is all good as the ghost of his dead father, and relishes the chance to offer some light relief as a Sinatra- humming gravedigger, with an ad-lib for the locals “get thee to the Cable Station and fetch me a pint of Poldark”. 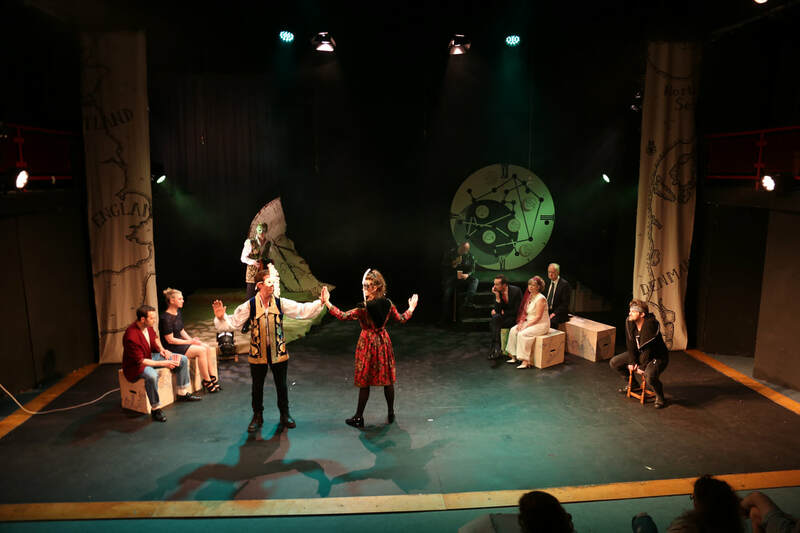 There’s more fun to be had when Yorick makes an appearance as a fantasy Father Christmas, so you see, this production was not totally immersed in madness, villainy and treachery, despite the seriousness of the plot. 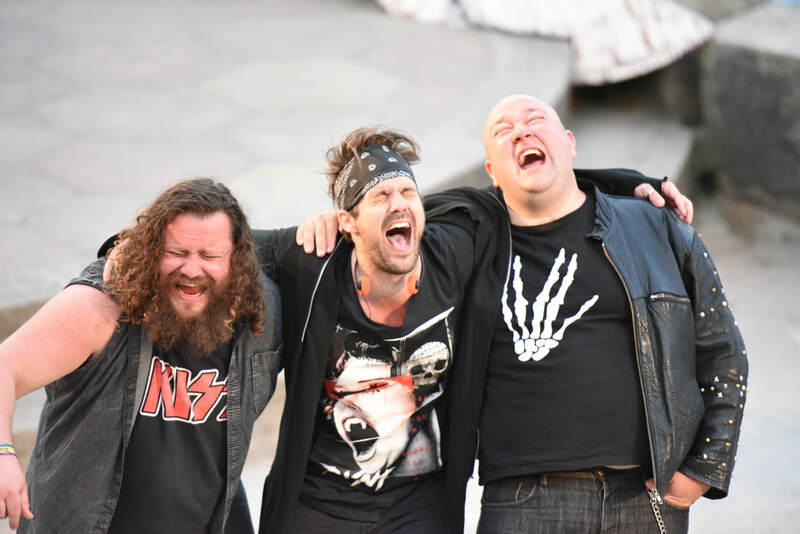 All is not rotten in this state of Denmark, in fact, a visit will be truly rewarding. 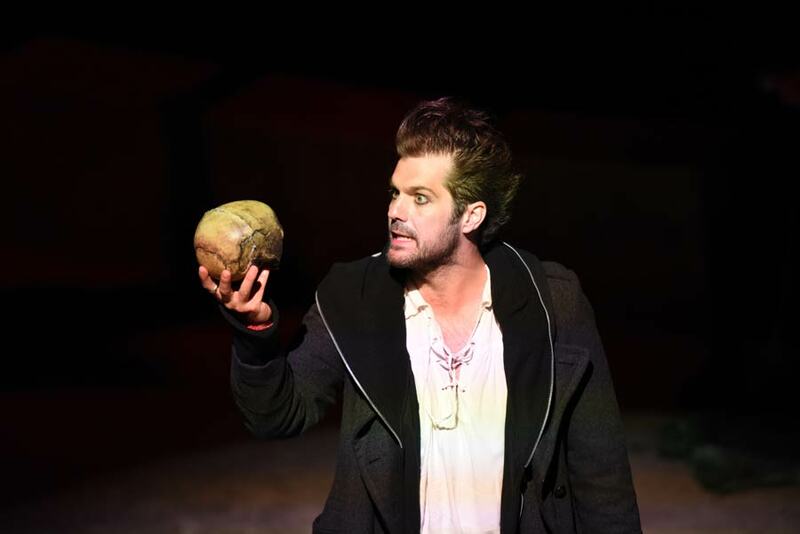 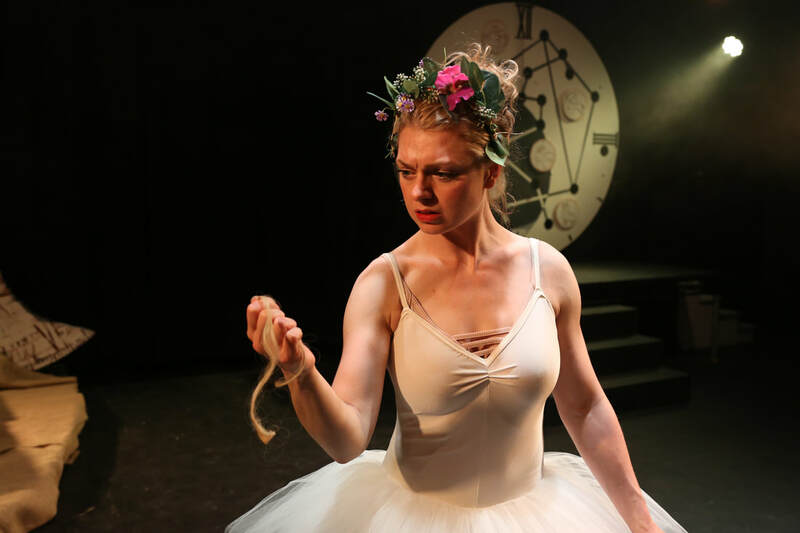 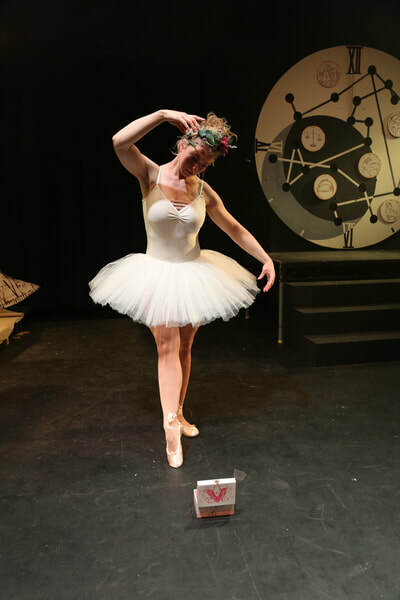 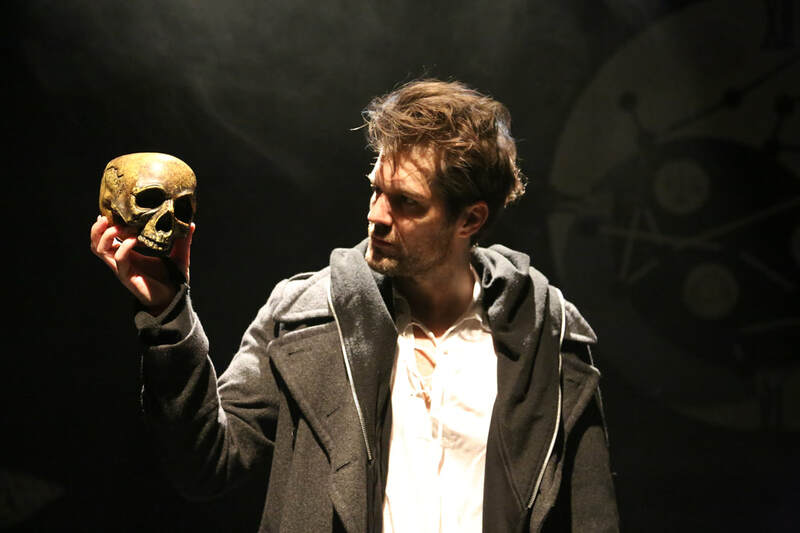 Hamlet is a massive challenge for any company: Shakespeare's longest play and arguably the most famous, influential drama in Western literature. 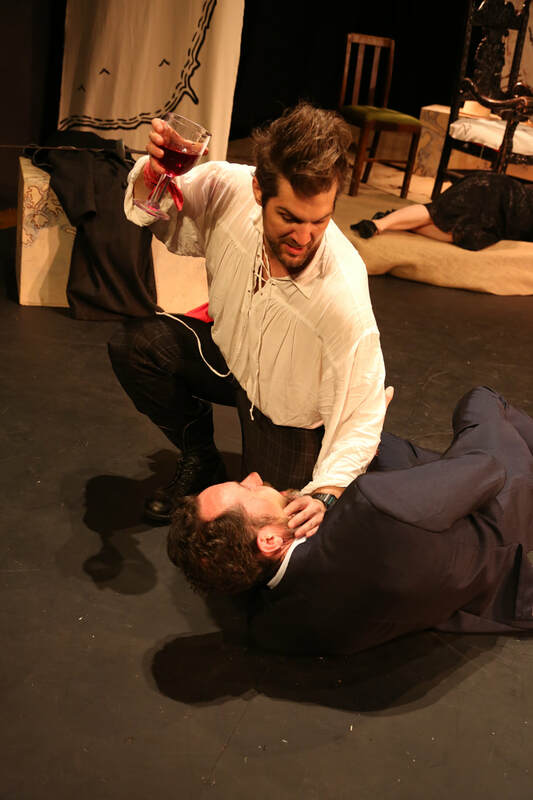 It has been performed in countless way over the centuries with scholars in constant debate about the nature of the prince's madness. 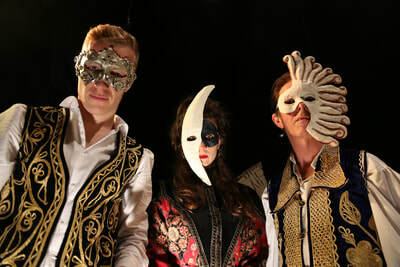 As their name suggests, Another Way present the tragedy in yet another way. 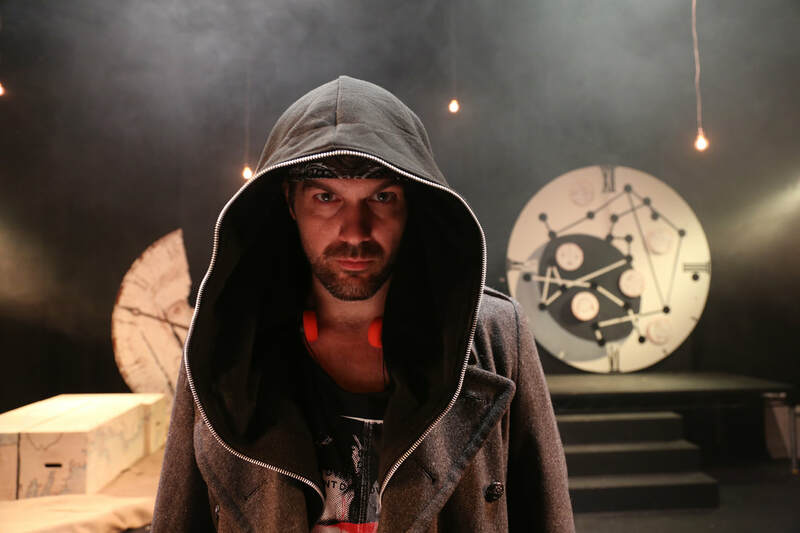 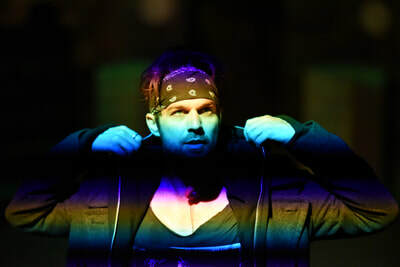 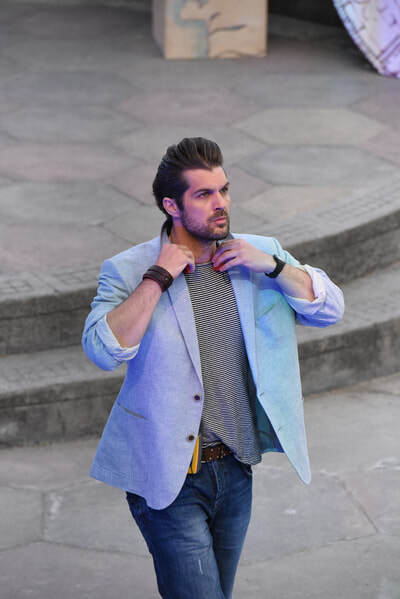 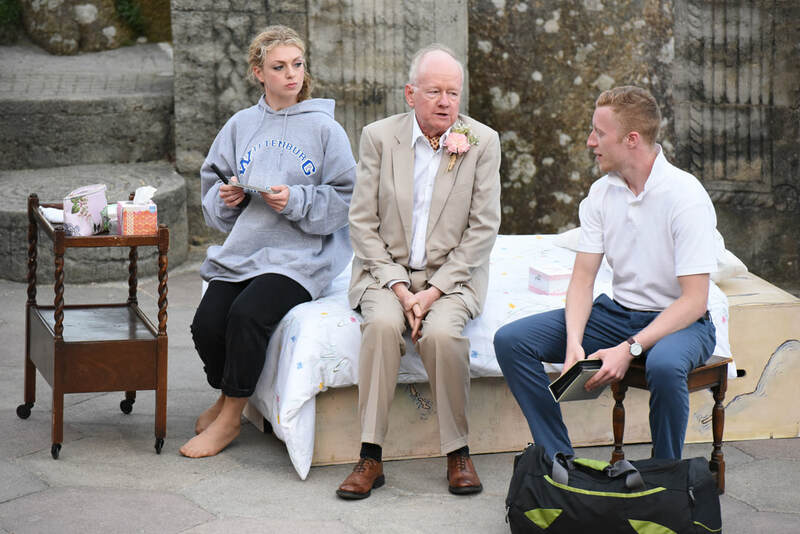 Their setting is the 1980s, hence costumes of suits and hoodies and characters busily using mobile phones while Hamlet immerses himself in loud music via his headphones. 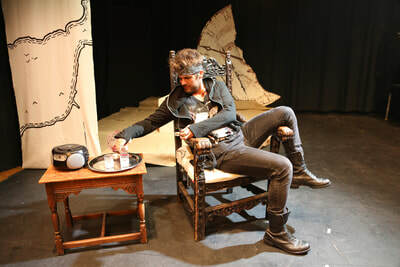 And yes, the incidental music is original too - hence a bit of Adam Ant's Prince Charming thrown into the mix. Chris Chambers, head of drama at Trinity who set up Another Way with his wife Nicky in 2010, directs with verve and an eye for detail. 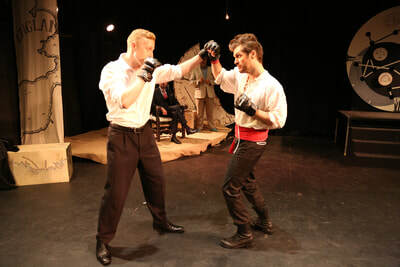 The text has been tweaked - for instance a gravedigger asks his mate to fetch him a pint of Doombar! - and trimmed, though running time is still way in excess of three hours (including interval), which means some sections sag a bit with garbled or indistinct delivery and a general lack of impetus to the plot. 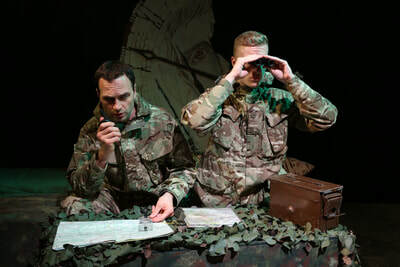 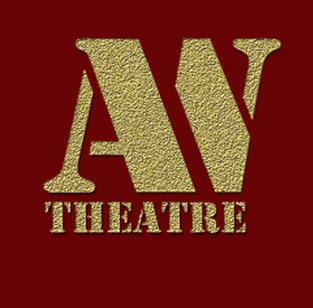 But in general it is an excellent, exciting production with a charismatic lead in Dan Avery. 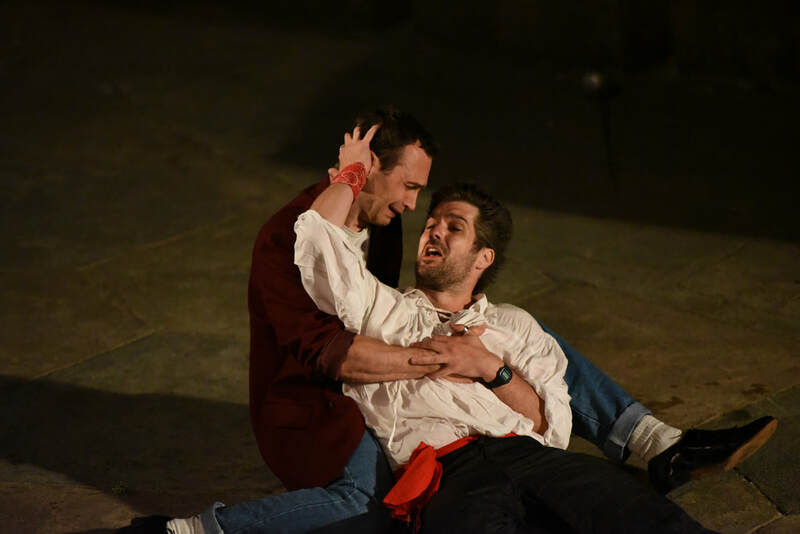 Programme notes tell us: "I wanted my Hamlet to be deeply emotional, immensely human, full of energy, passion and able to love deeply with his heart and soul." 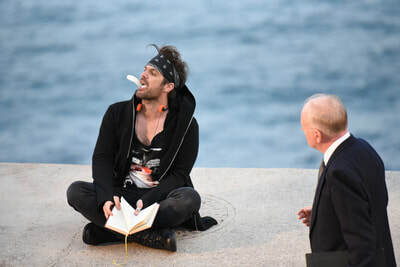 He is all of those things. 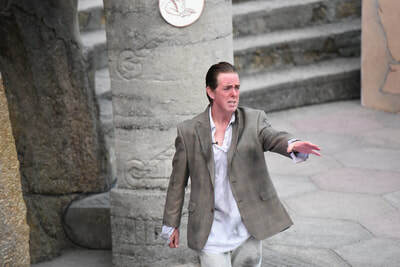 This is a modern man with a modern outlook, heartbroken, funny, rude and raw. 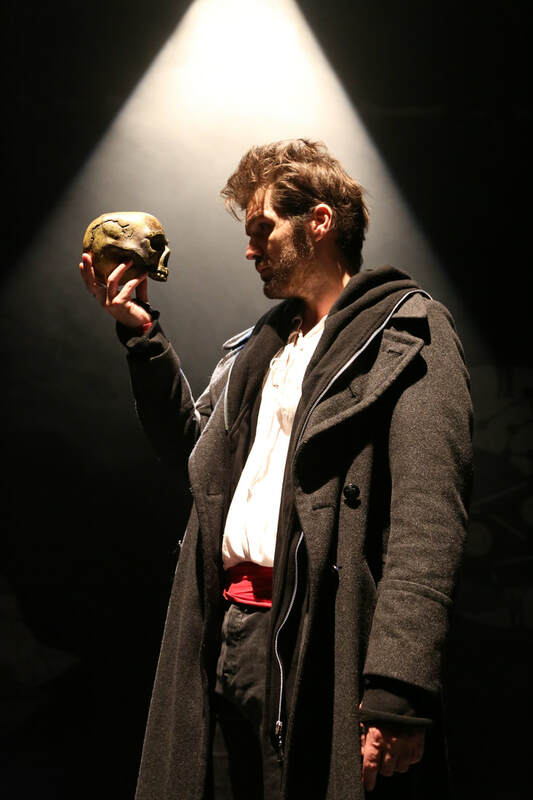 He explores the depths of human emotion, never for one moment letting his performance lose focus. There are many praise-worthy supporting players. Rosencrantz (Drummond Bowskill) and Guildenstern (Jan Szafranski) turn out to be real scene-stealers. 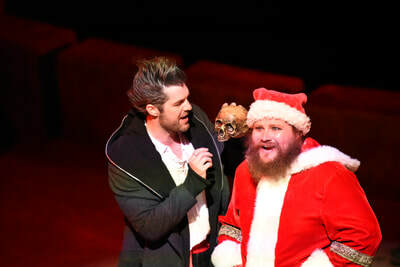 They make an hilarious double-act of dim biker types and they brightened the stage whenever they appeared. 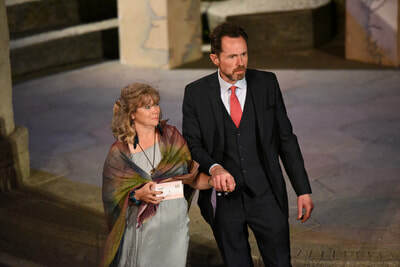 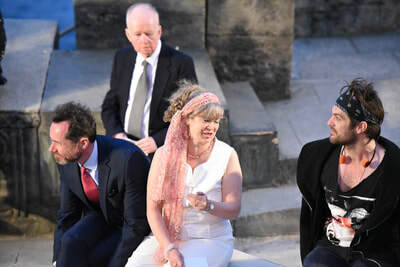 I would have liked Stephen Ashmore-Blakely's Claudius to have been a bit nastier, though the sensual stuff between him and Nicky Chambers' Gertrude was convincing, she a sweet woman completely oblivious to the evil all around her. 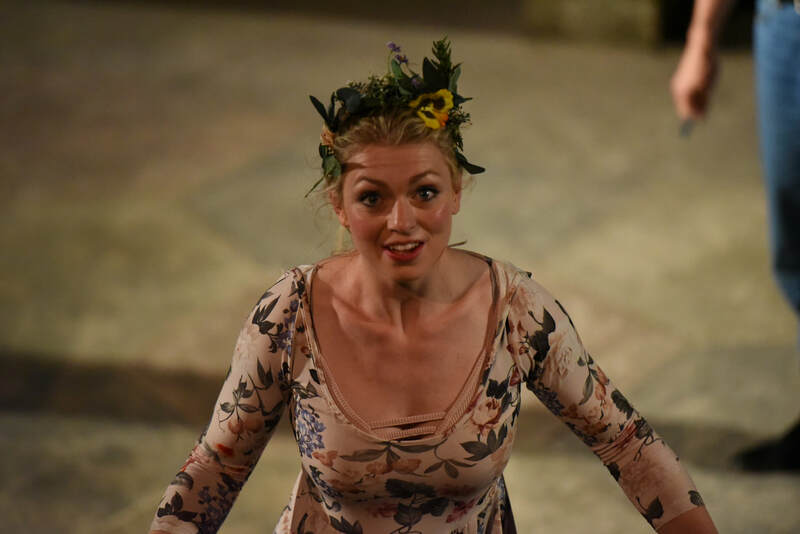 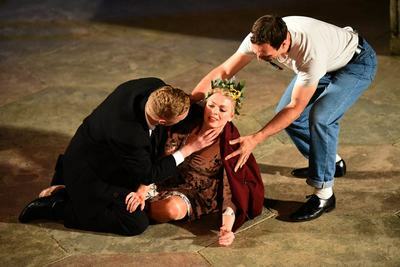 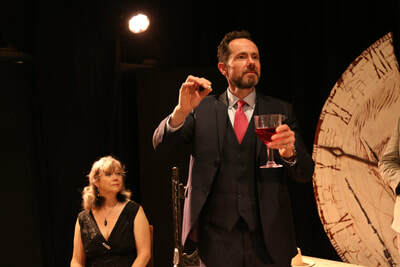 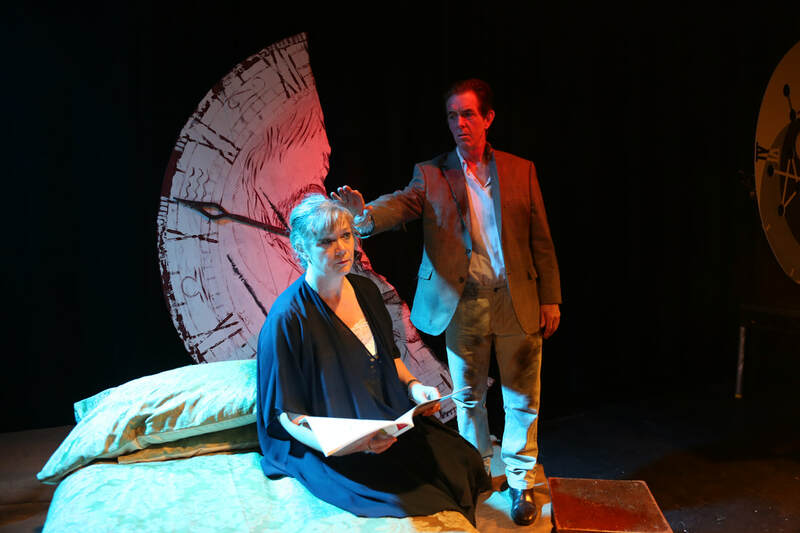 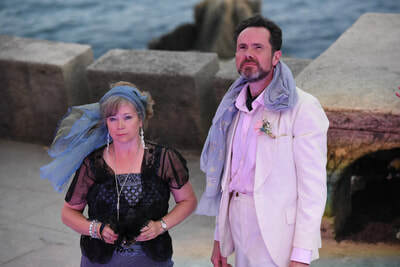 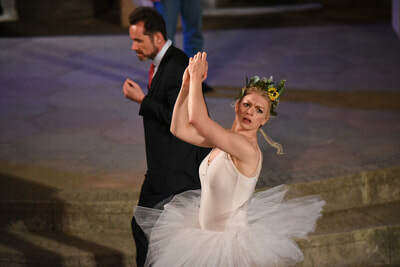 Rebecca Pickering's beautiful Ophelia, Anthony Allgood in a variety of contrasting roles, Robert Rowe as an irritating Polonius and Andrew Fitch as loyal Horatio all do their bit. 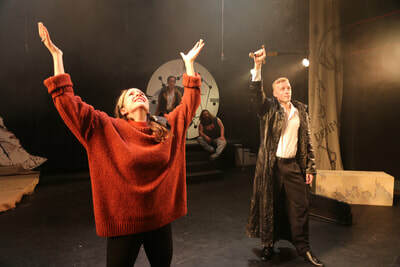 And what I also appreciated about this production was how the play's most famous lines, of which there are so many that have become absorbed into everyday use, shine like beacons. 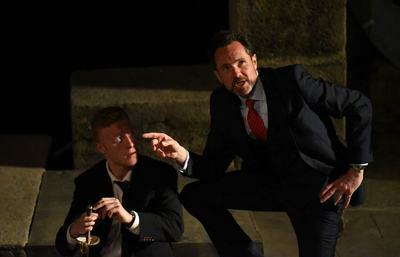 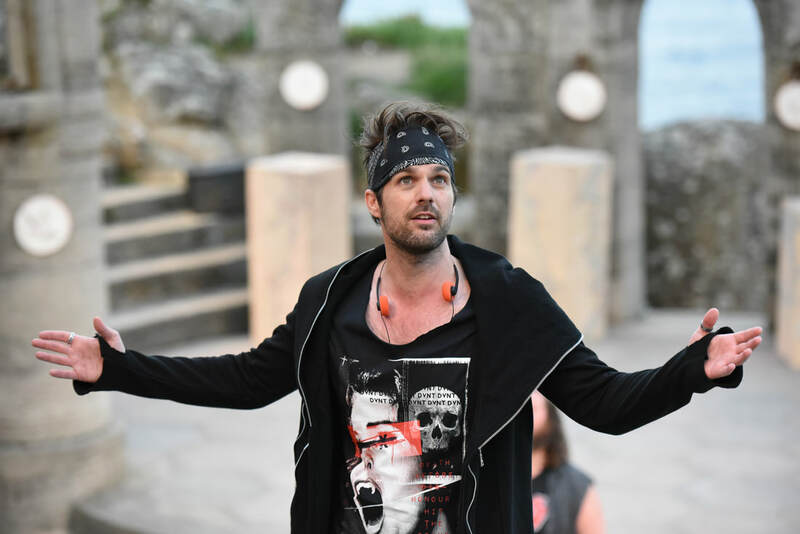 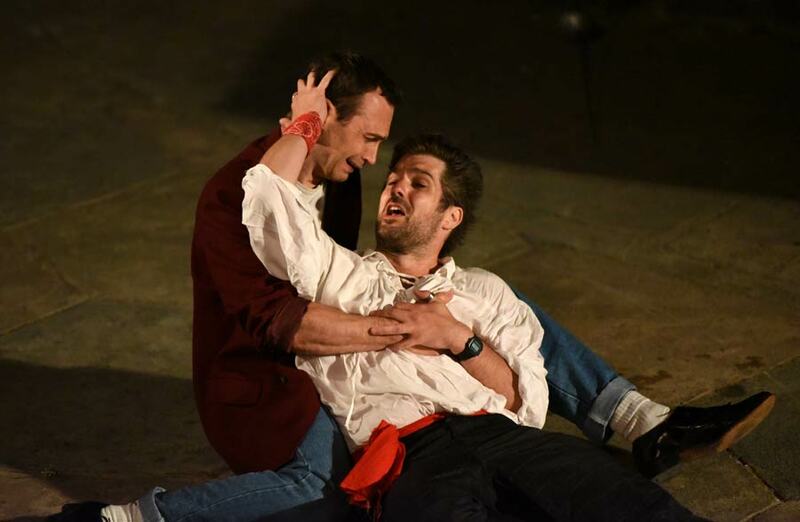 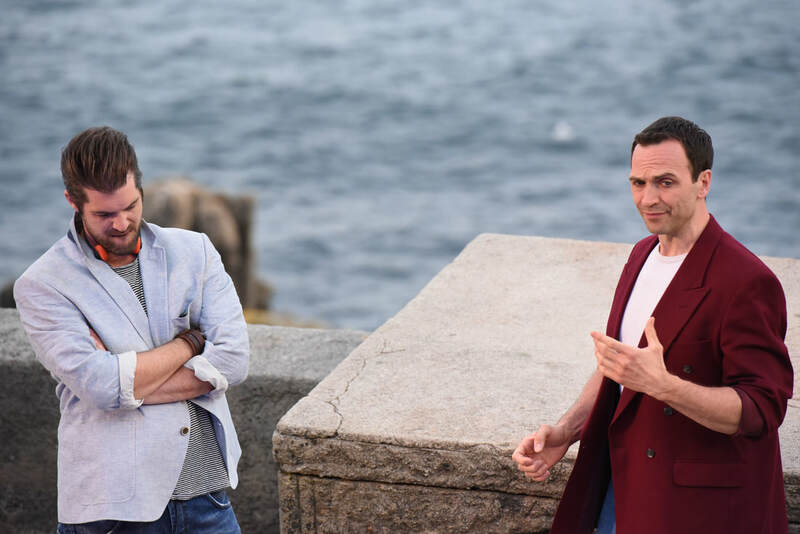 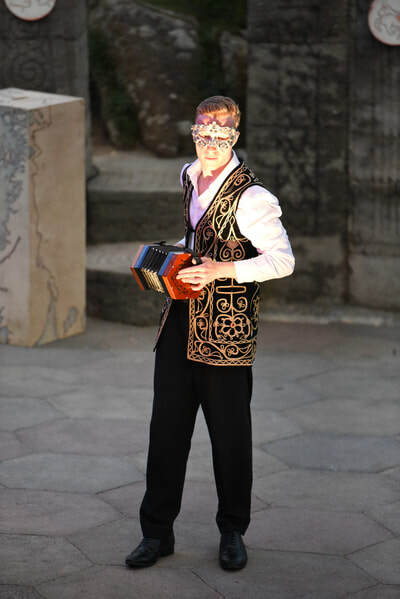 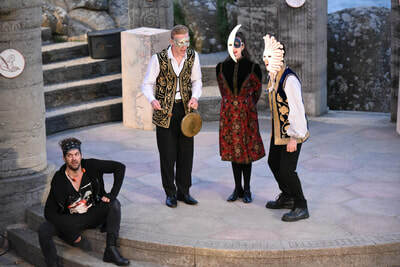 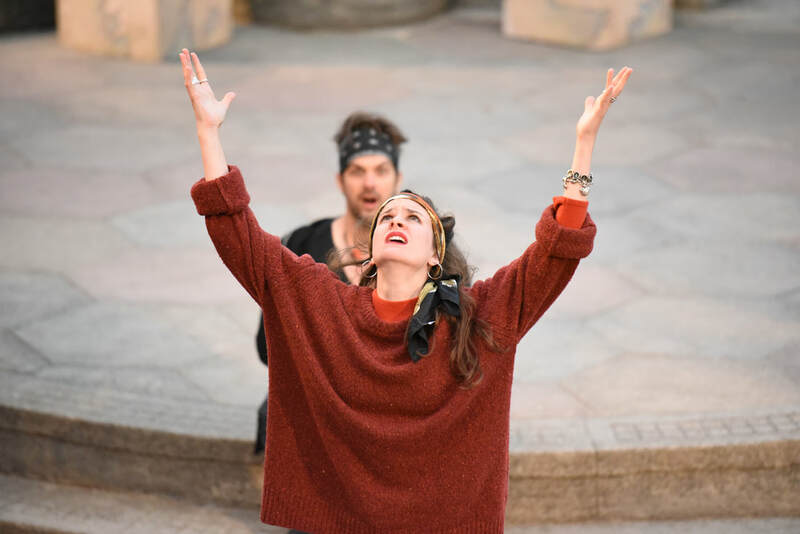 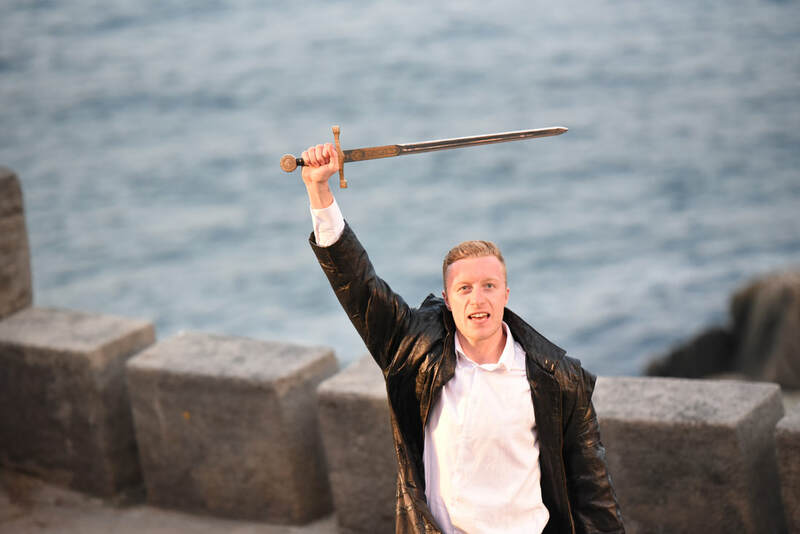 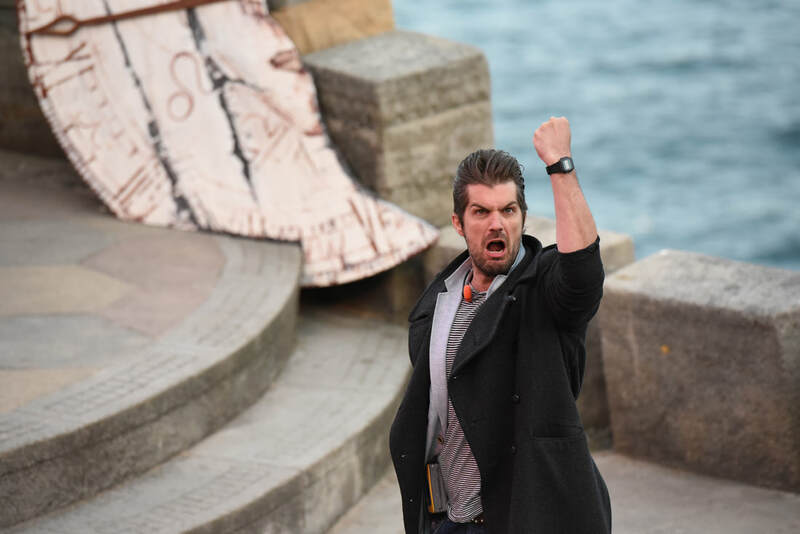 Another Way take their Hamlet to the clifftop Minack Theatre in Cornwall from June 4 to 8.